FOPI stands for 4\pi a synonym for the entire solid angle and is the name of a detector situated in the high energy target hall of GSI. It was designed by an international collaboration of 13 participating institution. The detector set-up was gradually built up and improved. The first experiments with a sub-system of FOPI took place already in 1991 and lately an additional gas filled detector which is placed in the innermost part of the set-up. 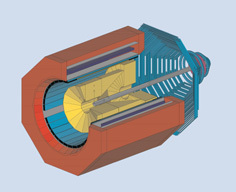 The FOPI detector is dedicated to measure the products of a collisions of two heavy nuclei with high energies. During the collision a zone of highly compressed and extremly hot nuclear matter is created for a very short time interval. This zone is expanding rapidly and emits fast particles. If the energies of the colliding nuclei are high enough even new particles will be created. The FOPI detector measures all charged particles which are emitted from the reaction. Aims of the FOPI experiments are to study the characteristics of heavy ion reactions, to reconstruct the properties of the hot and dense reaction zone and investigate particle production at the SIS beam energies.